Armenian and Latino "gangbangers" boast of battling rebels in online posts. 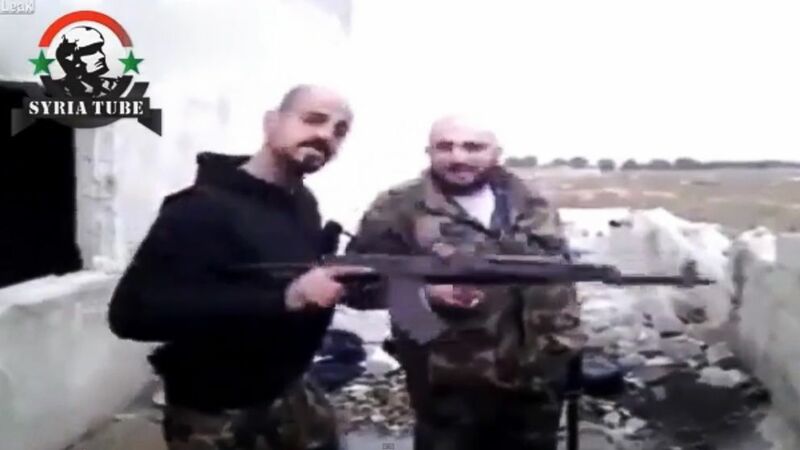 camera (YouTube) Two alleged members of a California-based gang claim to be in Syria fighting on support of embattled President Bashar al-Assad. Two Los Angeles gang members appear to have emerged armed and dangerous in the middle of Syria’s civil war, a senior counter-terrorism official confirmed to ABC News, sparking security concerns back on the West Coast. Though a version of the video appeared to have been posted online just in recent days, the footage first came to the attention of authorities a month ago, Los Angeles Police Department Deputy Chief for Counterterrorism Mike Downing told ABC News Sunday. "My organized crime and gang investigators found it online and on Facebook," Downing said. "We're kind of concerned about their recruitment and whatever other associates they have here... We predicted this would happen -- the [organized crime and terrorism] convergence. What we're worried about is the ones we don't know about here or coming back to the U.S."
Downing said the subjects are gang members, one Armenian and the other Latino, -- not radicalized Islamist jihadis -- fighting with Hezbollah militias to defend the secular regime of Bashar al-Assad, and they are not U.S. citizens. One, if not both, were deported from the U.S. long ago, he added, citing the gangsters’ public social networking posts. "We’re on the f--king frontline, homie. Front-f--king-line, homie. We don’t give a f--k, dawg," Wino says in the video, between firing rounds from a Kalashnikov rifle through a hole in a partially-destroyed brick wall at unseen "enemigas" purportedly in the distance. FBI Director James Comey and Director of National Intelligence James Clapper have made recent statements that dozens of U.S. persons have fought in Syria and are now under investigation or surveillance back in the homeland, for fear they learned terrorism tradecraft from the dominant jihadi groups there ideologically aligned with al Qaeda. U.S. counterterrorism officials have told ABC News more than 50 have returned to the U.S. with combat experience in Syria. But since al Qaeda and allied groups are fighting on the side of the rebels in the Syrian conflict, U.S. persons fighting there for Assad to stay in power -- like the two men in the new video -- are rare, sources said. Still, the FBI has opened a counter-terrorism investigation, a source said. FBI officials at the Washington, D.C. field office, which handles cases of U.S. persons fighting in Syria, did not immediately return calls by ABC News for comment. On Facebook, a self-proclaimed gang member named Wino Ayee Peeyakan, who appears to be the same man as in the YouTube video, has posted dozens of photos from Syria displaying his "APX3" gang tattoos symbolizing the Westside Armenian Power gang and admits he was deported from the U.S. several years ago, leaving behind a child in Los Angeles. "Man im come back thru Mexico turn my self in do couple of yers and get out [sic]," Peeyakan commented a year ago on a photo of his daughter. The other gang member appearing with Peeyakan in photos and the video calls himself "Creeper," and has tattoos for Sureños-13, which is affiliated with the Mexican mafia. "Tell the homies in f--king Middle East, homie, still gangbanging, homie, putting that s--t down for the big Sur-13 gang," Creeper says in the video as he fires his rifle. While the fighters do not explicitly state their motivations for joining the Syrian conflict, the scarves Peeyakan and other fighters he's pictured with are wearing appear to show the face of Hassan Nasrallah, the leader of Lebanese Hezbollah, the Iran-backed militant group that has joined the civil war on the side of Assad in the battle for Syria. Armenia and Iran enjoy close diplomatic ties, over U.S. objections. The Mexican mafia also is known to have ties to Hezbollah. In late 2007, counter-terrorism agents from the FBI and DEA in Operation Bell Bottoms busted several businesses in the Los Angeles area that were peddling cocaine and counterfeit designer clothing in a storefront operation run by the Mexican mafia that financially benefited Hezbollah, sources said at the time.